Ryuugamine Mikado is a boy who longs for the exciting life of the big city. At the invitation of his childhood friend Masaomi, he transfers to a school in Ikebukuro. Masaomi has warned him about people he doesn’t want to cross in the city: a champion fighter, an informant, and a mysterious gang called “Darazu.” Nervous from Masaomi’s stories, Mikado witnesses an urban legend on his first day in the city, the Headless Rider astride a black motorcycle. 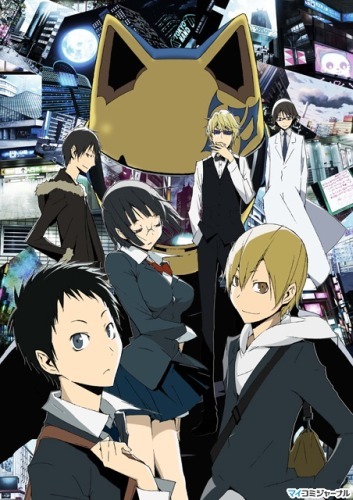 From then on, the existence of supernatural cases and a gang called the Yellow Turbans will rise to the surface, and Ikebukuro will pushed to the breaking point. Is it a god (kami)? Or a wolf (ookami)? A secret law in the old part of town … brings together dread and mystery. It is the summer of Shouwa 58, 1983. Ten stories, intertwined by the idle thoughts of people caught in repeating nightmares … what could possibly be the truth therein!? A 16 year old boy, Kuzumi Hiroshi, started to live in a new town that is located in the mountains. The town is separated into new and old streets by the river, and many mysterious local cultures still remain. Although confused and enjoying his new life, one person kept her distance from him: class committee member Kushinada Nemura. In their few encounters she gave him a word of advice: “Stay away from the old streets”. Her last hope is Shichika, the seventh and last practitioner of the Kyotoryuu — No Sword School. He and his sister live on an island cut off from civilization — they have no need for money. His sword school does not use swords — he would not want the swords for himself.